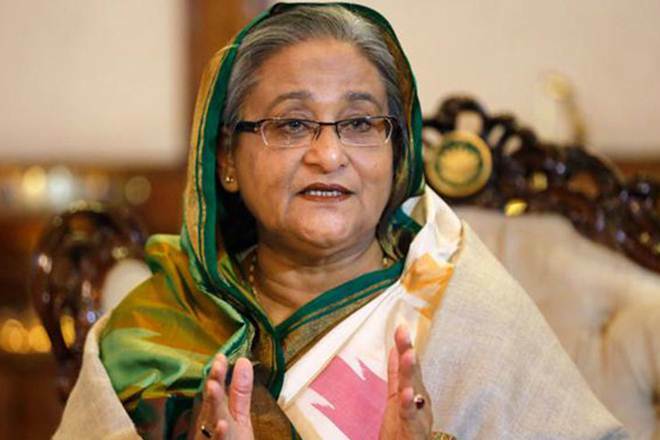 Dhaka: Sheikh Hasina was on Monday sworn in as Bangladesh’s Prime Minister for a record fourth term following her party’s victory in the December 30 election fraught with violent incidents and allegations of fraud by the opposition. Hasina, 71, was sworn in along with her new 47-member Cabinet before President Abdul Hamid at his official residence in Dhaka. Her ruling Awami League party and its allies won the polls by a landslide, securing 288 seats in the 300-seat Parliament. The largest opposition Bangladesh Nationalist Party (BNP) of former Prime Minister Khaleda Zia, imprisoned after being sentenced to 17 years for corruption, had won only seven seats. Hasina dropped 36 members from the previous Cabinet and also didn’t pick members of allied parties in her new Cabinet, bdnews24.com reported. She reserved the portfolios of Public Administration, Defence, Energy and Mineral Resources along with Women and Children Affairs. Leaders from Khaleda Zia’s opposition alliance — Jatiya Oikya Front — were absent from the swearing-in ceremony. They refused to take oath in Parliament last week, calling the elections a “farce” and demanded a repeat poll. Their demand was, however, rejected by the Election Commission. At least 17 people were killed in widespread violence on the day of the election across the country. Two more died in clashes between supporters of different parties later. The EU has called for an investigation into allegations of irregularities, saying “significant obstacles to a level playing field… tainted the electoral campaign and the vote”. The UN said last week that there were indications that “reprisals” targeted the opposition since the election, including physical attacks, arbitrary arrests, harassment, disappearances and filing of criminal cases.